On 13 September 2017, the Danish Agency for Culture and Palaces (Slots- og Kulturstyrelsen) has published an extensive study on the impact played by international players (such as Google and Facebook) on the media market, media providers and media content in Denmark. This report describes how, in recent decades, the Danish media market has become increasingly and fun­damentally impacted and dependent on the actions of foreign technology companies. The main conclusion of the report is that in 2017 Danish media companies are manifestly no longer capable of determining the technological, distributive or commercial standards they use when they pro­vide Danish content to Danish media consumers. The standards are now determined – and continually changed – by global players. Part I on Technological upheaval and new players, concludes that, in the last 30 years, the Danish media market has changed so much that it is almost unrecognisable. There were three rushes or paradigm shifts that together produced an avalanche of changes in the commercial opportunities open to Danish media companies: a global market, internet-based, digitised distribution of content to the user and datafication of the interactions between users and companies on the market. 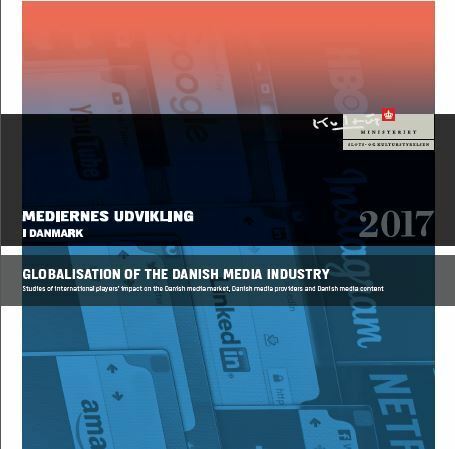 Part II of the report, Economic displacement and the search for new business models, describes the in­ternational players’ significance for Danish media’s business opportunities – with focus on trends in the advertising market and the market for subscription-based media content. The primary conclusion of this part of the report is that, within a period of 10 years, Danish media companies have become increasingly heavily dependent on foreign technology companies, chiefly Google and Facebook. These two players dictate how Danish media companies interact with users and advertisers. Part III of the report, Upheavals in distribution and new journalistic processes, describes how interna­tional technology companies influence Danish news media content, how Danish journalists produce this content and how content originating from news media and social media respectively is distributed and interacts in a new Danish news loop. The principal conclusion of this part of the report is that the social media have transformed the distribution of news media content, reorganised work processes and created strong pressure on Da­nish media companies to adapt accordingly. Part IV, Trends and perspectives describes the technological breakthroughs and trends that can be expected to impact the Danish media industry within a few years – e.g. artificial intelligence, robots and virtual reality. It outlines the challenges and dilemmas stakeholders in and around the industry must tackle if they are to ensure viable production of media content in the Danish language in the short and medium term. The final chapter of the report concludes that upheavals in and globalisation of the Danish media indu­stry are the most urgent cultural and political challenges of our time. Finally, the report lists eight essential issues that politicians and media stakeholders should consider in connection with impending negotiations regarding Danish media subsidies.